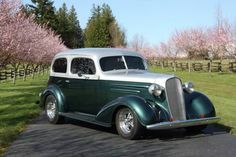 This is a top-notch incredible 1937 Sedan with classic lines and a modern ride. The all steel exterior is maroon and the paint is excellent.The tan leather bucket seat interior is new and in excellent condition. The door and window handles are all Billet as well as the trim on the dash.Engine is a new crate Corvette ZZ4 engine with automatic transmission.Options include power steering, power brakes, and AC.The front end is a Fat Man front end. Rear is a Buick rear end.This 1937 Chevrolet is located in North Carolina in the Charlotte area.